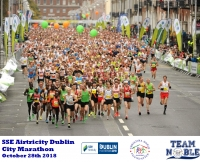 Description : The SSE Airtricity Dublin City Marathon will take place on Sunday the 28th of October 2018 and will begin in Fitzwilliam Street Upper, Dublin 2. 1st wave will be at 09:15, 2nd wave at 09:30 and 3rd wave at 09:45. Registration is now open and can be done through the SSE Dublin Airtricity website.